I represent an authentication scheme. For now my children store the scheme metadata. Should we need multiple configs of a single scheme, a new class should be made, and the config specific calls on Auth::Scheme moved to it. Definition at line 27 of file Scheme.h. Definition at line 32 of file Scheme.h. Definition at line 31 of file Scheme.h. Definition at line 30 of file Scheme.h. Definition at line 35 of file Scheme.h. Definition at line 36 of file Scheme.h. References AddScheme(), createConfig(), Find(), FreeAll(), GetSchemes(), operator=(), Scheme(), shutdownCleanup(), and type(). Definition at line 20 of file Scheme.cc. 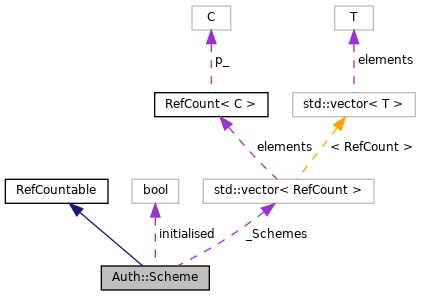 References assert, GetSchemes(), and i. Locate an authentication scheme component by Name. Definition at line 33 of file Scheme.cc. References GetSchemes(), i, and NULL. Referenced by getConfig(), parse_authparam(), Auth::UserRequest::scheme(), and ~Scheme(). Final termination of all authentication components. To be used only on shutdown. All global pointers are released. After this all schemes will appear completely unsupported until a call to InitAuthModules(). Release the Auth::TheConfig handles instead to disable authentication without terminiating all support. Called when a graceful shutdown is to occur of each scheme module. On completion the auth components are to be considered deleted. None will be available globally. Some may remain around for their currently active connections to close, but only those active connections will retain pointers to them. Definition at line 60 of file Scheme.cc. References assert, GetSchemes(), shutting_down, and size. Referenced by SignalEngine::FinalShutdownRunners(), and ~Scheme(). Definition at line 44 of file Scheme.cc. Referenced by AddScheme(), authenticateSchemeCount(), testAuthConfig::create(), Find(), FreeAll(), testAuthUserRequest::scheme(), and ~Scheme(). Definition at line 70 of file Scheme.h. Definition at line 67 of file Scheme.h.